13 October 2014, at 1:33a.m. 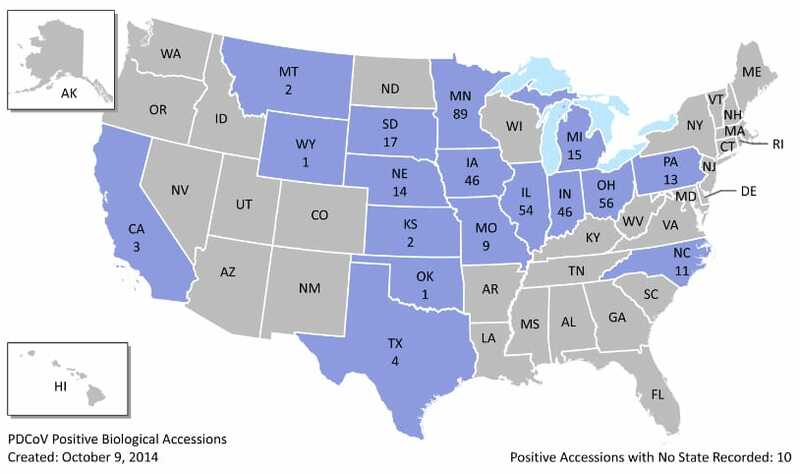 US - There were six new positive results for Porcine Delta Corona virus (PDCoV) detected in the US in the last week, so the total number of positive samples so far now stands at 393 in 17 states. For the latest weekly report - for the week of 28 September in a report dated 8 October from the USDA Animal Health Inspection Service and made available by the American Association of Swine Veterinarians (AASV) - six pig farms (termed "swine accessions") have tested positive for the PDCoV. Three of these samples came from Iowa and one each from from Illinois, Indiana and Minnesota. The cumulative total now stands at 393.